Mr Grant, who was a Territorial At-Large candidate under the Myron V. Walwyn led NDP, tendered his resignation from the BVIF&FC and this was accepted according to a Cabinet release published by the Government Information Service (GIS) on Monday, April 8, 2019. Further, more changes were instituted with the resignations of Mrs Xavyrna Samuels-Fahie as Deputy Chair and Treasurer Mrs Nashema Smith-McKenzie. Mr Khalid A. Frett will now be the Vice Chairman and Mr Nicholas Bailey will serve as the new Treasurer. New members of the Committee for the administrative term include Mrs Violet de Castro, Ms Sasha D. A. Flax and Sharia B. de Castro along with Mr Greggory A. Callwood, a representative from Jost van Dyke. 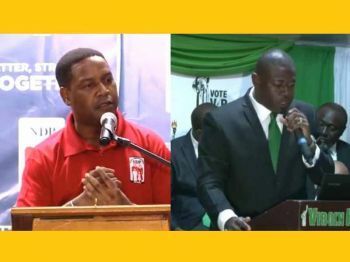 According to Deputy Premier and Minister for Education & Culture, Dr the Hon Natalio D. Wheatley (R7), under the chairmanship of the NDP aligned Mr Grant, the committee now has a 300k debt and will be forced to scale back its planned festivities such as the 65th Emancipation Festival to be held in late July and early August 2019. However, the Minister said that on a positive note, person owed by the previous Dr D. Orlando Smith led NDP administration, have already indicated a willingness to work with the VIP government, given his administration's commitment to repaying the monies owed. Don’t let the door hit you on your way out Trefor! Election has consequences so there is no surprise that Grant is out and Cline is in at BVIF&FC. Clearly, there are jobs that are inherently political and are reserved for the government in power. Personnel taking these jobs know or should know that their duration ties to the time a government is in power. When the political wind shifts, so is the jobs. This breeds instability, inconsistency, unproductivity .......etc. These jobs are political rewards and often don’t attract the best, brightest and the best fit for the job. These jobs result in a Peter Principle situation, ie, people are often promoted/appointed to a level of incompetence. Further, then, on the other hand, there is the career and professional civil servants who works tirelessly and quietly with their heads down regardless of what government is in power, expressing their political preference at the ballot box. Read the article!! The man and some of his cohorts tendered their resignations. nobody was fired. Please READ AGAIN!!!!! @ sick of nonsense & Faith, where in my comment did I say or even infer that anyone was FIRED. “Election has consequences so there is no surprise that Grant is out and Cline is in at BVIF&FC.” Where did you get fired out of that? Perhaps, you should take your own advice. I have old wife skin so criticism rolls of my back like water on a duck but let’s keep things real. This is one of the smallest debts owing for festival. Name one year festival wasn't in the red. be good to all please that why we see a change.